Iowa lawmakers got an extra early start to this Memorial Day weekend. Senators have not met to debate at all this week and most of the 100 members of the Iowa House gathered for just one day to vote on bills. 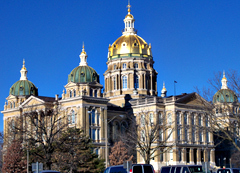 However, legislative leaders have been holding countless private meetings this week with Governor Terry Branstad’s top staff, to try to draft a spending plan for state government operations. “Hopefully there will be a breakthrough and things will come together,” Branstad told reporters during an interview at the statehouse Thursday. Lawmakers face a looming deadline of July 1, 2015. That’s the first day of the next fiscal year and there’s no budget plan in place. The main problem is Democrats control the Senate and Republicans control the House, plus the governor is a Republicans, so any spending plan must bridge partisan differences. Senate Democratic Leader Mike Gronstal said after weeks of closed-door meetings, there is an “understanding” between the two sides, but no deal. “They’ve shown an openness to working with us,” Gronstal told reporters Thursday. The largest stumbling block? Legislators can’t agree on how much general state aid to send to Iowa’s public schools for the academic year that begins in August. The governor is urging legislators to make that spending decision for each of the next two academic years. A legislative insider said “little tiny steps” are being taken to span the distance that separates Republicans and Democrats as they seek to agree on an overall spending plan for state government operations. House Speaker Kraig Paulsen, a Republican from Hiawatha, said there is a “real possibility” a budget deal might be struck next week. In 2011, legislators waited ’til June 30 to get a final state budget draft done, voted upon and sent to the governor’s desk for his review.